I awake from my slumber to breath taking views of Spitsbergen. Tall, dark, sheer mountains with blankets of snow and smooth white glaciers reach a sea that is calm as a millpond. 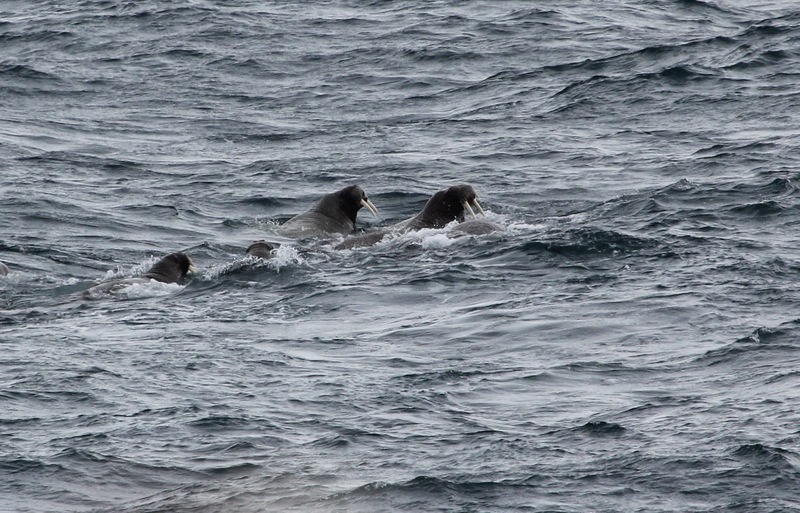 The only ripples are created by the hundreds of auks. Everywhere I look there are Little Auks, Brünnich’s Guillemot, Black Guillemot and Puffins, either sitting on the water or streaming by in low flying groups. Amongst them are Fin Whales, surfacing against the stunning, mountainous backdrop. It is paradise. Our first stop is the town of Longyearbyen. An industrial place, with mines carving across the mountainside, looming over the houses that to be honest look a little worn against the grey skies. Throughout the town Snow Bunting sing, males in full breeding regalia flit from building to tundra to rock. I brave the Arctic Terns that nest right next to the road, I do not blame them for swooping and attacking me in protection of their precious eggs. Right next to the sign warning me to go no further without armed protection (this be Polar Bear country) I meet familiar birds, Grey Phalarope – known here as Red Phalarope – and Purple Sandpiper in stunning breeding plumage. Eider nest right next to a compound filled with howling Huskies. Later as the ship heads back out of the Fjord, sunshine starts to spill through gaps in the cloud cover, and dazzling in this light are the blows of a group of Fin Whales. Astounded I watch these whales milling, not moving fast or feeding, but resting. Amongst them there are clearly younger, smaller animals, and in amazement I watch as one lifts its tail fluke out of the water, a behaviour I have seen many times in Humpback Whale and Sperm Whale, but that is more unusual in this, the second largest animal on the planet. Our second stop is probably the most stunning, this was the day that the beauty of this remote, wild landscape was truly revealed in glorious splendour. Brilliant blue skies reflected in blankets of snow which covered the research town of Ny-Ålesund. A sheer, cracked wall of blue and white ice rears up where glacier meets sea. Immense mountains surround the town whose houses are brighter and feel more welcoming. 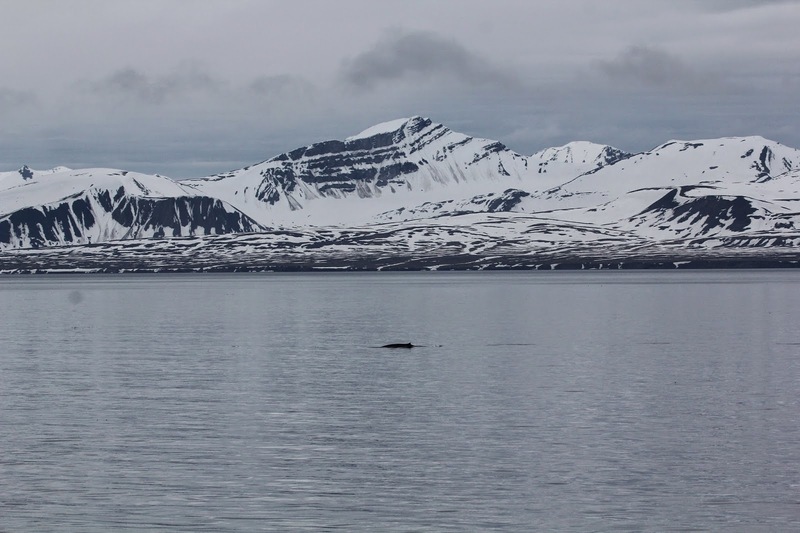 Early in the day a Humpback Whale is sighted feeding in front of the glacier at the end of the bay. All day it works its way to and fro in front of glacier and mountains, feeding amongst the meandering ice bergs. 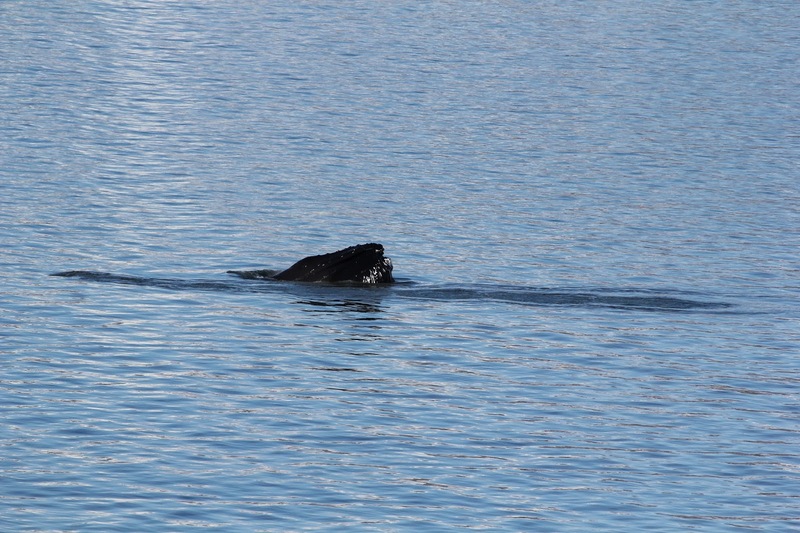 Mid-afternoon and the whale has worked its way right in front of the stationary ship. Bubbles appear, rippling the calm blue water, and with a whoosh of breath the whale appears, throat and mouth distended as it gulps fish and water in one go. It dives with a flick of its tail fluke, and moves a little further on. The Arctic wildlife on land is just as impressive; amongst the snow and houses, the raucous screeching crescendo of Arctic Terns once more signals their intent to protect their nests by any means. Reindeer wander across blankets of snow. Long-tailed Duck, Snow Bunting and Barnacle Geese mingle on the tundra with Purple Sandpipers and Turnstones. Long-tailed, Arctic and Great Skua careen through flocks of Kittiwakes and terns that are feeding just off the shore. It is hard to say goodbye to such a dramatic and beautiful place as the ship headed away once again surrounded by Little Auk and Brünnich’s Guillemots. The final stop is Magdalena Bay, the most northerly, remote and wild of all the places we visit. Here the mountains are closer, looming perhaps ominously above a small circular bay where once again icebergs swirl. Glaciers sweep down between the sheer cliffs and rocky screes. Closer inspection reveals thousands of Little Auks swarming around the mountainside where they are nesting amongst the rocks. The ship nestles itself at anchor amongst the icebergs and we spend a morning watching the Auks, soaking up the wilderness. Again it is hard to leave such a raw and beautiful place, but as we leave with the smooth rippling waters giving way to waves and white caps, a sudden movement alongside reveals seven or eight Walrus! They surge up through the waves, tusks bared, tumbling over each other as the ship headed out to sea.